In their unrelenting pursuit of perfection, the engineers at Yamaha continue to improve and expand on an already outstanding receiver. The new RXA-3070 continues in this tradition exemplifying all the Yamaha ADVANTAGE line has to offer, the Yamaha RX-A3070 will revolutionize how you view your Home Theater and sound system. Pairing both the best in audio and visual capabilities, the RX-A3070 features a potent 150 watt x 9 channel amplifier, a redesigned symmetrical layout and heat sink, and a larger power supply than its predecessors. Dolby Atmos is the new hot surround format, and for good reason! This exciting sound format allows for a more precise placement of all surround effects in the movie soundtracks to bring your movie enjoyment of your favorite blockbuster to a higher level. There are many movies already being released in this presentation. For those ready to astound on movie night, the RXA-3070 provides eight HDMI 1.4 4K compatible inputs with HDCP 2.2 4K Ultra HD pass thru and up-scaling with premium HD Ultra video processing, and numerous video adjustments and enhancements, including mosquito and block noise reduction. The RX-A3060 will also up-convert all your analog video signals, such as your VCR, to HDMI, scaling them to 1080P using its HD Ultra video chipset, so all of your favorite classics look better than ever before. Also included are ESS Technology ES9016S Sabre32 Ultra DAC and ES9006A Sabre Premier Audio DAC's for the highest level of performance with all of your audio and video sources! Networking capability is a hot buzzword these days, and the Yamaha RX-A3070 has you covered. This receiver will allow you to listen to the thousands of available internet radio stations, playing virtually every genre of music that you can think of from anywhere in the world, as well as, the ability to listen to Pandora, Rhapsody, and recently added Tidal Hi-Res streaming, as well as, music files of your computer. Now included in the new RXA-3070 is Wi-Fi wireless connectivity to your wireless network, so no more having to run an Ethernet cable from your router to your receiver. In addition to this level of control; the new YAMAHA AV receivers are fully compatible with their new device called MusicCast. You can connect to as many as nine separate MusicCast devices throughout your home, and allows you easily distribute any music source that is connected to your RXA-3070 to these units, even your turntable! Now you can enjoy a full distributed music system in your home that is fun and very easy to use controlled thru your Smartphone or tablet. Virtually endless possibilities from one receiver; and performance to match, the RX-A3070 is currently on display here at The Stereo Shop. Come on in and let us show you what you've been missing with your favorite movies and music! Rhapsody Yes, currently over 10 million songs. Internet Radio Yes, almost a century of popular recordings - new and old. The Yamaha RX-A3070 raises the bar again for outstanding sound and video quality, while giving you all the connections you need now and the future, while also being extremely flexible and fun to use! The Aventage series of Audio/Video receivers are defined by an obsession with details: Yamaha's R&D team takes a careful look at every design aspect-circuitry, construction, components, volume and sound reproduction qualities-to achieve the purest, best-sounding audio and the best video reproduction possible. Featuring handpicked components that are continually evaluated and tested for peak performance; the Yamaha RX-A2070 pushes the boundaries for the best sounding, mid-priced receiver to dramatic new heights. This is why every Yamaha Aventage Audio/Video receiver is covered with a full three year parts and labor warranty. The new Yamaha RX-A2070 is powerhouse of a receiver offering a staggering 140 watts of power thru each of each nine channels, and with two subwoofer outputs delivers a new sense of realism that was unheard of until now! Dolby Atmos is the new hot surround format, and for good reason! This new exciting soundtrack allows for precise placement of all surround effects in the movie soundtracks to bring your movie enjoyment of your favorite blockbuster to a higher level. There will be many movies being released in this format and with the Yamaha RXA-2070 will have you covered. The Yamaha RX-A2070 features eight HDMI 1.4 inputs with HDCP 2.2 4K Ultra HD pass thru and up-scaling , which will allow you to connect all of your video components, now and well into the future, and all of your audio components, even a turntable input! Also this receiver is fully Network compatible, you can now "stream" and listen to the thousands of music stations throughout the world, or listen to your music on your computer! Now included in the new RXA-2070 is Wi-Fi wireless connectivity to your network. No more having to run an Ethernet cable from your router to your receiver! There are three separate zones available, which makes this receiver a perfect choice as part of a whole-house distributed audio system! There is a new exciting feature called "Party Mode", with just one button press, you can play the same source through your, home comes in handy when you are entertaining! In addition to this level of control; the new YAMAHA AV receivers are fully compatible with their new device called MusicCast. You can connect to as many as nine separate MusicCast devices throughout your home, and allows you easily distribute any music source that is connected to your RXA-2070 to these units, even your turntable! Now you can enjoy a full distributed music system in your home that is fun and very easy to use controlled thru your Smartphone or tablet. If you're looking to bring heightened excitement to your home theater, the RX-A2070 will surely do the trick. And with its tried-and-true Yamaha sound quality you will be continually impressed with its performance both in your home theater and when enjoying music for years to come. The substantial high-end look and feel of the RX-A2070 goes far beyond aesthetics, to deliver unprecedented sound quality. 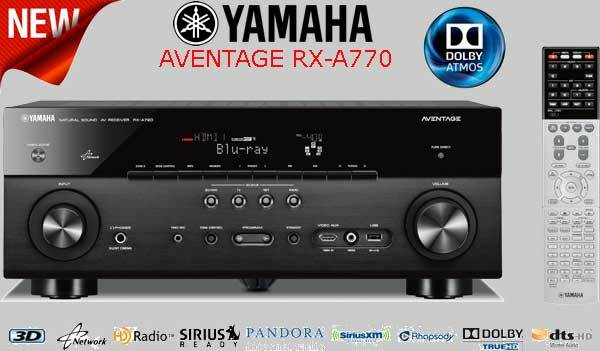 TThe new Yamaha Aventage RX-A1070 is one of their highest-performance Audio/Video receivers. Rated at a potent 110 Watts of power into each of its seven channels, careful attention was paid to the details, and nothing was overlooked. One example of this is the symmetrical layout of the amplifier and the power supply for higher performance and less audio noise. Even designing the cabinet for lower resonance and adding a fifth foot to reduce vibration that can affect audio performance is prepared here with this receiver. Dolby Atmos is the new hot surround format, and for good reason! This new exciting soundtrack allows for precise placement of all surround effects in the movie soundtracks to bring your movie enjoyment of your favorite blockbuster to a higher level. There will be many movies being released in this format and with the Yamaha RXA-1070 will have you covered. Yamaha has made sure that this would be a receiver that the end user can grow into, and not out of. There are eight HDMI 1.4 inputs with HDCP 2.2 4K Ultra HD pass thru and up-scaling. The easy to use SCENE control is a simplified way to use your receiver, for example, if you want to watch a DVD movie, simply press the DVD scene button on the remote or on the front panel of the receiver. The receiver will then turn on, select the correct input for the DVD, and then select the appropriate audio surround mode! With other receivers that would require at least three or possibly more button presses. There are four pre-selected SCENE buttons on the front as well as four more for controlling the second zone, and an additional four that can be set by the user. The RX-A1070 has Network capability for listening to internet radio, Rhapsody, Napster, Pandora, and Tidal music services. There is a new exciting feature called "Party Mode", with just one button press, you can play the same source through your home; comes in very handy when you are entertaining! In addition to this level of control; the new YAMAHA AV receivers are fully compatible with their new device called MusicCast. You can connect to as many as nine separate MusicCast devices throughout your home, to allow you easily distribute any music source that is connected to your RXA-1070 to these units, even your turntable! Now you can enjoy a full distributed music system in your home that is fun and very easy to use, controlled thru your Smartphone or tablet. The accessibility of this model's really what makes it so attractive. The Yamaha RX-A1070 is a no brainer for any household searching for a versatile crowd pleaser that also supplies high end sound. Check it out today here at The Stereo Shop! 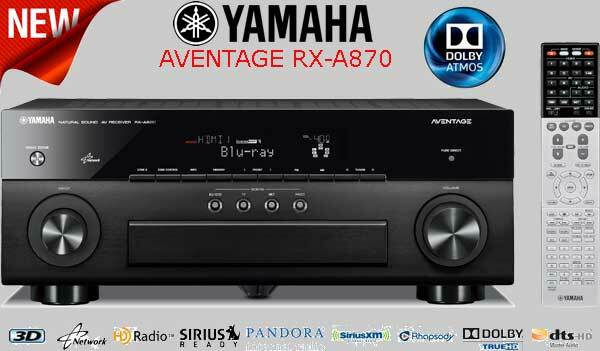 The new Yamaha RX-A870 is an easy to operate receiver that sounds great with all of your music sources and movies. As part of the Aventage series, attention was paid to the important small details and parts quality, something that many other companies overlook. A powerful 100 Watt seven-channel amplifier that uses discrete outputs for a richer, more dynamic, and life-like sound on all of your movies and music. Yamaha made sure that you have plenty of connections for all of your audio and video equipment; there are eight HDMI 1.4 with HDCP 2.2 4K Ultra HD pass thru and up-scaling . The Yamaha RX-A870, like their higher end models, now offers Networking capability! So, you can not only listen to thousands of internet radio stations throughout the world, but also you can listen to Rhapsody, Napster, Tidal, and Pandora music services. Now included in the new RXA-870 is Wi-Fi wireless connectivity to your wireless network. No more having to run an Ethernet cable from your router to your receiver! And with Yamaha's YPAO Auto-Setup audio calibration system assures that you will always have a great sounding system and a receiver you will proud to own for many years to come! If you're after the realism the ADVANTAGE line has to offer, but at a modest price, have no fear, the RX-A770 is a great choice. Rated at 90 watts of power to each of its seven channels, this amplifier uses high-quality discrete output transistors for a rich, dynamic sound that makes all of your music and movies come to life! Dolby Atmos is the new hot surround format, and for good reason! This new exciting soundtrack allows for precise placement of all surround effects in the movie soundtracks to bring your movie enjoyment of your favorite blockbuster to a higher level. There will be many movies being released in this format and with the Yamaha RXA-770 will have you covered. You want to be sure that you will be able to connect all of your video components, Yamaha has it covered with the RX-A770, there are six HDMI 1.4 inputs, and including one located in front of the receiver, with HDCP 2.2 4K Ultra HD pass thru and up-scaling. Yamaha's exclusive SCENE control allows you to easily operate your receiver; for example, if you would like to watch a Blu-Ray DVD movie, with SCENE, simply press the Blu-Ray/ DVD button. The receiver will turn on; select the correct input and the appropriate audio surround mode! There are so many other connections on this receiver, even a turntable input, so you can start playing your records again! 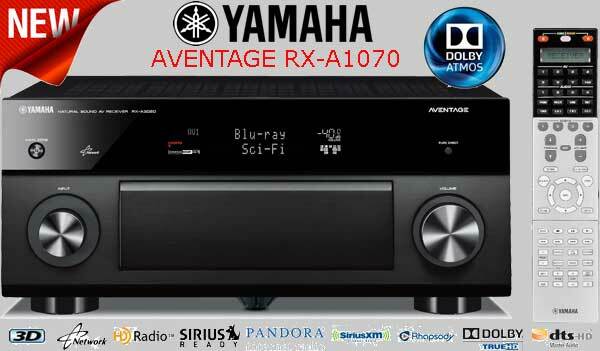 The Yamaha RX-A770 now offers Network capability which means you can connect to the internet and now listen to thousands of available internet radio stations streaming throughout the world, as well as, Rhapsody, Tidal, and Pandora music services also. Now included in the new RXA-770 is Wi-Fi wireless connectivity to your wireless network. No more having to run an Ethernet cable from your router to your receiver! In addition to this level of control; the new YAMAHA AV receivers are fully compatible with their new device called MusicCast. You can connect to as many as nine separate MusicCast devices throughout your home, to allow you easily distribute any music source that is connected to your RXA-770 to these units, even your turntable! Now you can enjoy a full distributed music system in your home that is fun and very easy to use controlled thru your Smartphone or tablet. Prepare for bigger laughs, more tears, and more enthralling movie experiences right at home. Pop the corn, crack open a cold bottle, and look forward to movie night with this Yamaha receiver, impressive in its own right. When space is tight, the Yamaha RXS-601 will make the most of it without sacrificing performance. As an example, our RX-A760 is 6 3/4” high while the slim and compact RX-S601 is 4-3/8” high and offers similar performance at a fraction of the size. With its space saving design, the RX-S601 will fit nicely in tight spaces. The RX-S601 delivers audio performance at the head of its class, thanks to a revamped ground and power supply pattern, as well as meticulously selected and custom designed parts, such as the transformer and heat sink. It also features analog discrete amplifier construction, a low jitter PLL circuit and high power output. Other top-grade features include an aluminum front panel and high-grade, large screw-type speaker terminals. The Total Purity Concept, which Yamaha has been cultivating for many years, encompasses high drive amp technology, high purity pre-amplification, anti-vibration technology and independent pure power supplies. All models have a fully discrete power amplifier that helps to minimize distortion. This AV receiver is compatible with many audio formats such as Dolby® True HD and DTS-HD Master Audio™. They are also compatible with FLAC/WAV 192 kHz playback. You will enjoy excellent sound quality from a Blu-ray Disc™ and other types of high resolution sources. The Yamaha RX-S601 offers Network capability which means you can connect to the internet and now listen to thousands of available internet radio stations streaming throughout the world, as well as, Rhapsody, and Pandora music services also. If you would like to play music in another room, the RX-S601 has a second zone, this would allow you to, for example, play a Blu-Ray DVD movie in the main room, while listening to Pandora in another part of your home at the same time! The Yamaha RX-S601 is the receiver for anyone that desires a great sounding, versatile unit, all the while without taking up all of your valuable room in your cabinet! Stop in the Stereo Shop to check out this receiver, and all of the other fine Audio/Video receivers from Yamaha as well.